As the year draws to a close, we’ve been reflecting on all the wonderful books we’ve read in 2011, and in doing so, we’ve also realized there are some classics worth revisiting. The authors and friends of Oxford University Press are proud to present this series of essays, which will appear regularly until the New Year, drawing our attention to books both new and old. Here, Michael P. Adams, author of From Elvish to Klingon, writes about the 1961 print edition of the Oxford English Dictionary. I had never owned the thirteen-volume first edition (that’s the original 12 volumes, plus the 1933 Supplement) of the Oxford English Dictionary until 20 December of this year, when my wife presented it to me on my fiftieth birthday, whether to celebrate the birthday as some kind of achievement or to console me for it is still unclear. The set represents the 1961 printing of the OED — that is, it was printed in my birth year. It looks new — even the dust covers are intact— but smells a bit musty, as it should, as anything (or anyone) from 1961 is bound to smell. How could the OED not be my favorite book of the year? Probably, it’s my favorite book ever. The first thing to do with a book one receives as a gift is to open it and start reading. There’s plenty of time to consider the heft of a volume or peculiarities of its design later. I unwrapped Volume XI: T-U first, and we examined its glories: Tenant at will was where our interest rested first, but we were soon off to Tenaculum and Tenaillon, then back across the two-page spread to the sub-entry Tenant-righter. We wanted to read the definitions, of course, but even more, we wanted the quotations. Tenaculum, for a type of forceps, is first recorded in English in 1693, though it never really entered it, as there are ‘tramlines’ along the entry (║), indicating that the editors considered the term ‘alien or not yet naturalized’. The 1693 quotation is from a medical dictionary. In fact, all four quotations to 1899 are from medical dictionaries, so it isn’t a word I’m likely to use, I suppose, but I’m glad to know about it anyway. Time passes quickly when reading the OED, as it passed while we were reading it a few days ago. It’s the hazard attending every other foray I’ve made into it since. Nowadays, most people who need the OED professionally or want to address some specific lexical issue turn to the online version. I’m no different, and the online Dictionary obviously has features no print version can match. But the electronic OED can’t completely replace the printed version, which serves purposes for which it is uniquely suited. One of those purposes is reading. When the New English Dictionary — the original Oxford English Dictionary — began to appear in fascicles in January 1884, with the part for A-ANT, it arrived in the mail like any other periodical, and the recipient sat somewhere, one hopes in good light, and simply read it, read it without a cursor or a mouse. Some, I’m sure, less dedicated to alphabetical inquiry, skipped from entry to entry as whim took them; others, I’m just as sure, read the fascicle from beginning to end. James A. H. Murray, the Dictionary’s chief editor then, referred to what one reads in it about Tenaculum or Tenaillon as an ‘article’. If one is fortunate enough to own the fascicles or the print edition as originally set (I am), then one can read the articles at one’s leisure. I prefer reading for long stretches, but one entry on the fly, if it’s the right entry, can be refreshing. The bound volumes are heavy to hold, but I doubt a set of the fascicles is likely to arrive at my door any time soon, so I make do. When we were discussing Tenant at will, Jenny and I, our son, Oliver, was looking over my shoulder. He had turned two-years-old just days earlier; the Dictionary didn’t hold his attention long, but he was curious. 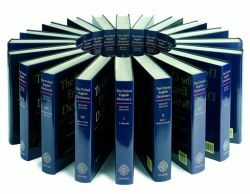 I count my set of the OED as the best OUP book I’ve read in 2011 because I started to read it in that year. Of course, I will continue to read it for a long time to come, and it occurs to me that I may not be its only reader. At the thought, celebration and consolation seem very much like the same thing. Michael P. Adams is Associate Professor of English and Director of Undergraduate Studies in the Department of English Language and Literature at Indiana University. He currently edits quarterly journal American Speech and is President Elect of the Dictionary Society of North America. His published work includes Slayer Slang: A Buffy the Vampire Slayer Lexicon (2003) and Slang: The People’s Poetry (2009). His most recent book, From Elvish to Klingon, published in November 2011.